To explain it in the simplest form possible, hard determinism disregards the existence of free will and supports determinism. This PsycholoGenie article explains the concept of hard determinism in detail. "There is no absolute or free will; the mind is determined to wish this or that by a cause." How many times have you heard the quote, "It's a free country" from friends, family, acquaintances, and even strangers? We bet you are going to take time to count. As liberal citizens of an independent country, we generally believe that we are free to do what we want. But, this theory of libertarianism or free will is often challenged by a philosophical theory called determinism. This theory, determinism, proposes that all events, both natural and those caused by human action, depend on the causes of the previous events. It implies that, human beings have no free will as such, and that the humans have no moral responsibilty of their own actions. This is further supported by hard determinism, which states that determinism is true, while free will is false. The paragraphs below elaborate on this concept. The standard definition of hard determinism states that no event or action takes place with the individual's choice, and it is completely determined. The belief is that the future is determined by past actions, and every action has a cause. The future is, thus, a causal result, and no individual choices will change it. Human beings are not responsible at all for their actions, as they have no will or power to act on their own, and that their actions are the effect of certain predetermined causes. Partially contradictory themes include soft determinism, indeterminism, and libertarianism. The concept, however, does not evolve from a philosophical point alone, but encompasses the entire universe, including the ever-practical laws of physics. In essence, man has always had a logical perspective to the events unfolding in the world backed by facts and predictions. Hard determinism suggests that these events are likely to happen due to an action that has taken place earlier, and that no amount of further information could or should change the facts in any way. Certain concepts like quantum mechanics are believed to be indeterministic, though the possibility seems highly ludicrous. And yet, there have been a multitude of instances where hard determinism could be a possibility. Determinism can be confused for fatalism as there exists a very minute difference between them. In fatalism, the final fate, rests with destiny. No matter which path one takes, an event will take place if it is "destined" to happen. In determinism, on the other hand, the final fate, rests with the results of past events. Once a event occurs, it will have replications causing future events which cannot be altered. One of the principal strengths of hard determinism seems to lie in the fact that somewhere along the basics, the concept follows the laws of physics. Many laws are based and have evolved from what has been observed and performed and declared, and any future statements primarily focus on what has been established. This restricts the thought process and limits the scope of the invention, despite the positive results. Similar observations have been recorded in the field of mathematics, where one thinks of the actions performed earlier and determines the current action to be performed. The weakness of this theory is the unnatural acceptance of whatever takes place. The fact that actions and events are predetermined have a profound effect on the mind, and one forces himself to accept things without considering the other alternatives. If one opposes the existence of free will, it makes no sense to him to try to do anything at all, the way he wants to. He is under the supreme belief that irrespective of his actions, the results are going to be the same. So why work or take any effort at all? The scientific society has long since disregarded the existence of concepts without tangible evidence (near-death experiences, out-of-body experience, etc. ), and though this concept has a stronger philosophical side, experts vouch for its accuracy. One of the best arguments for hard determinism would be the famous Leopold and Loeb case of 1924. The fact that Clarence Darrow, the defense lawyer, employed hard determinism is not officially mentioned, but the case synopsis says it all. Nathan Leopold and Richard Loeb, two university students, were charged with the murder of a 14-year old boy, a crime that ideally deserved capital punishment in the eyes of many. Mr. Darrow, however, employed hard determinism, stating that the action was bound to happen, and that the boys were merely instruments of the action. He further stated that their upbringing and environment played a vital role in transforming their mindset, and that they were not morally responsible for what they did. 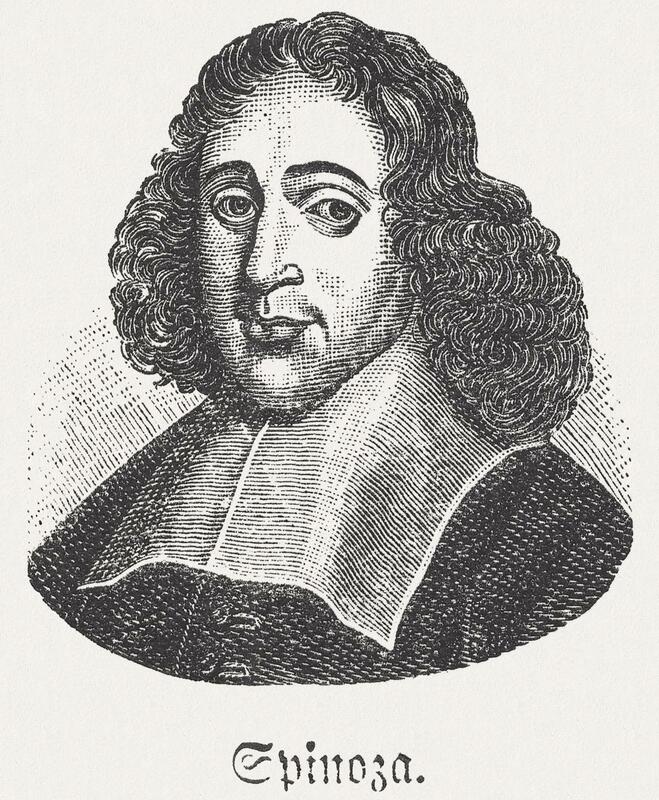 In other words, he established the fact that the boys were mentally influenced, and the crime was not a result of their free will, but a crime that was bound to happen. Consider one of the most common examples of crime. Assume that a man has killed his girlfriend because she left him for another man. If logic were to be believed, the man should be punished severely because he has no right to kill his girlfriend because she left him for another man. No denying that the girl was morally wrong, but the law does not give the man the right to kill her. In this case, hard determinism argues that the man was not morally responsible for his actions, as this was bound to happen, i.e., the man was bound to kill his girlfriend because of her past actions. It states that the action had prior causes, one of them being the girlfriend's actions, another one would probably be his bad upbringing, etc. Ultimately, it holds the view that the man is not responsible for anything despite committing the crime. Many religions hold a view that certain events are bound to happen, come what may. However, perhaps, certain actions might prevent the severity of those events or the pattern of occurrence. Hard determinism is in favor of point one, while completely ignoring point two. 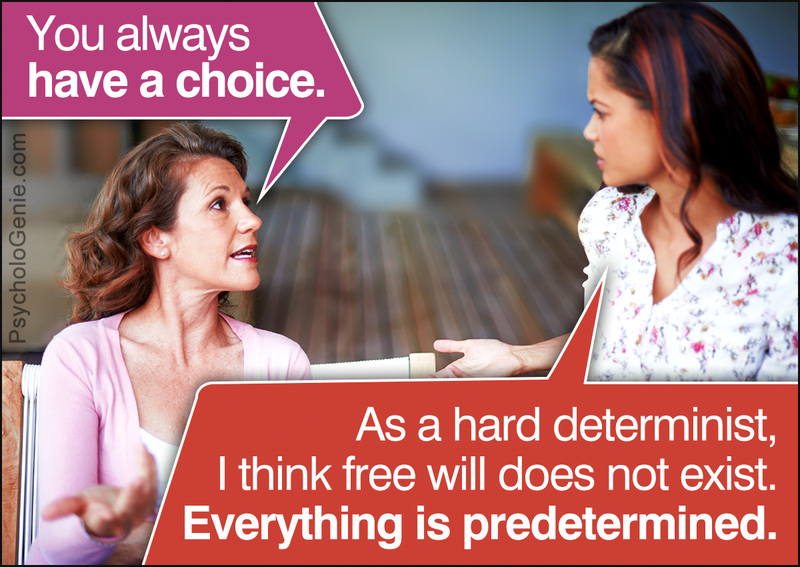 On no account does it even consider that free will could be a possible choice to shape the events of the future. 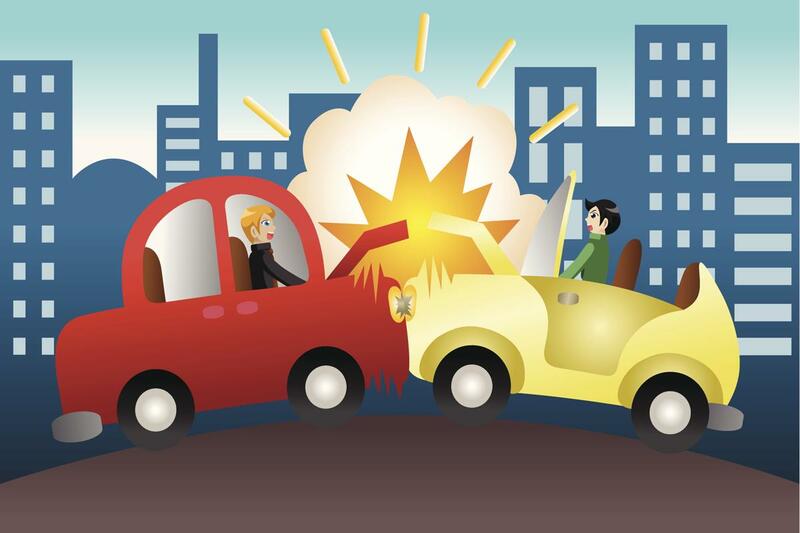 Consider another simple example of a man who is driving erratically and meets with an accident due to an ongoing collision with a tree. According to hard determinists, even this event is caused as a result of the past event. The possible reasons can be anything ranging from, the man being drunk or he being frustrated due to bad day at work or break up with his girlfriend. In short, the event was triggered due to previous events and that the man isn't responsible for his crash. Hard determinists opine that the action was meant to occur due to antecedent causes and not due to a free choice. They believe that people are different, and the difference lasts for a period due to a reason. Our actions and our fate are destined, and even if something changes, it happens so because it was meant to be. One of the main problems with hard determinism is its justification with certain actions that are ideally wrong in the eyes of many. This viewpoint has invited several criticisms for this subject. To begin with, agreeing with this theory leaves you with a 'Forget it, it was bound to happen' attitude. While thinking so may be useful in a situation where something bad occurred or perhaps you have gone through the loss of a loved one, it does not make much sense in a simple situation, like scoring bad grades for a paper. What is your justification going to be in this case? 'Oh, I was bound to score less. It was predetermined'. Does this even make sense? Somewhere, experts agree that certain actions are beyond our control. This has been a universally accepted theory that has originated from diverse cultures. However, this attitude will chain you to a restricted thought process. Another point that invites criticism is depicted in the example above. If a person commits a crime in complete awareness that it is lawfully wrong and that he is liable to be punished, how can hard determinism be a defense in stating that the person is not responsible for the crime because it was destined or preplanned? This theory corrodes the very existence of law, justice, and order, and to an extent, basic humanity. Every individual has his own perspective that stems from his upbringing and personal experiences. From a neutral viewpoint, we can state that every individual does have a choice to make; he needs to choose his path and put in his best foot forward to achieve his goals. He may or may not be successful the way he expected to. This occurrence may or may not be predetermined, but the fact that he worked towards his goal will give the individual immense satisfaction and lead to a graceful acceptance of the situation.